Moreover, we will bring to the storerooms of the house of our God, to the priests, the first of our ground meal, of our grain offerings, of the fruit of all our trees and of our new wine and oil. And we will bring a tithe of our crops to the Levites, for it is the Levites who collect the tithes in all the towns where we work. 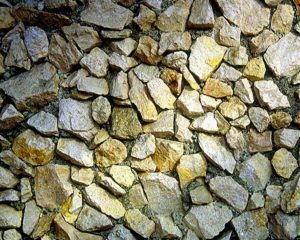 Suggest that all of this material can be purchased at a building supply (stones, gravel, sand in the garden section) and super center (glass container, pitcher and pail). All should be very dry so the gravel and sand pours freely. Notes to the Leader: This study does not require a high component of discussion and can be used if the group is new or young. You will be trying to decompose the typical Christian response to priority setting, “God should be first.” The idea of God first, however, is more complex. You will begin your study by doing a demonstration. Instructions follow. The demonstration will then be used as the discussion topic for the lesson. Begin to fill in the glass container with large rocks. Place them carefully in to the container until it is full. Then ask the question, “Is it full?” The response of your group is not important, just move to the next step. You do not have to tell your group what you are doing. In fact, a little mystery at this point is good. In each progressive step, more and more of your group should have become skeptical and realized that you could keep on packing more into the glass container. At the end, take one more large rock and ask someone in your group to put it into the container. It should be so full at this time, that one more would not fit. Section One: What’s the Point? It is an example of (my) life, etc. The container represents life. The rocks, gravel, sand and water represent the choices we make and the priorities we set. The moral of the story is: In order to fill the container (life) to the maximum, you must put the big rocks in first. Ask your group the question, What are the big rocks of life? What is the gravel of life? What is the sand of life? Note: You are not looking for Biblical answers here, like “Jesus.” Use worldly things. The moral of the story so to speak is that God wants to be one of your big rocks and He wants each of us to put Him into our life first, before we fill our life with the other things (rocks, gravel, sand and water). The example shows that you have plenty of room for other big rocks, gravel, sand and water but if we wait until our life is full, it is very hard to find room for God. Have someone in your group read Mark 10:23-27. This is the famous story about a rich man and a camel fitting through the eye of a needle. Jesus wasn’t referring to a sewing needle when he talked about a camel going through the eye of a needle. The “eye of a needle” was referring to a small gate within the larger gate at the entrance to a city, probably Jerusalem. It was common to build an ordinary door in the huge gate so that the ordinary people of the day could go and come in the city without leaving the large gate wide open all the time. For a camel to get in, he would have to take off the burden of all he was carrying on his back, and kneel down and crawl through the door. So Jesus was comparing the rich young rulers many possessions as a burden to him. He was giving his treasure more importance than service to God. He had used his money to fill his life with large rocks. He was unwilling to put God in his life first. For that reason, he went away very troubled at what Jesus told him. He was unwilling to change his ways. In the story of a Samaritan woman’s meeting with Christ she is amazed by the fact that Christ knew everything about her life. While this is often the key point of the story that is discussed, there is an interesting and inconspicuous reference to her water jar that gives us an indication of a change in her priorities. After her encounter with Christ, and her enlightening of His wisdom, she stopped what she was doing and went to tell others. In her response lies the answer to the question of balancing God and life’s priorities. Once we understand who Christ is, it is impossible to continue life as it was. Our priorities change as we begin the process of a Christ-directed life instead of a self-directed life. We make God a rock and put Him in our water jar. How is Paul’s story similar to our rock example? It is a somber story that could be the front page of any newspaper in America or, worse yet, a story about our representatives within our government. Paul is very serious here. He ties the entire depravity of mankind to the simple mistake of not placing God first into the container of life. God is too good to let someone spend an eternity in hell. Let my kids decide about God for themselves, I don’t need to influence them. Note to the Leader: End with a personal exchange between you and each of your group members. Have a supply of large rocks in a pail. One at a time, go to each group member and hand him or her a rock. Look them straight in the eyes and tell each person that the reason you are involved in this study is that you want share what you have learned in life. “God is a big rock and true joy comes when He is put into life first.” Re-read the key verse from Nehemiah 10:37 emphasizing that God does not ask for all we have, just “firstfruits” taken from the bounty He has provided each of us. God provides us with many choices that we can freely make but He expects to be the first one we make.